A kids lesson is primarily based around safety and having fun. Performance is a secondary objective. Nonetheless the basics of surfing are easy to grasp even for younger children. A good level of surfing can be achieved given the right conditions. 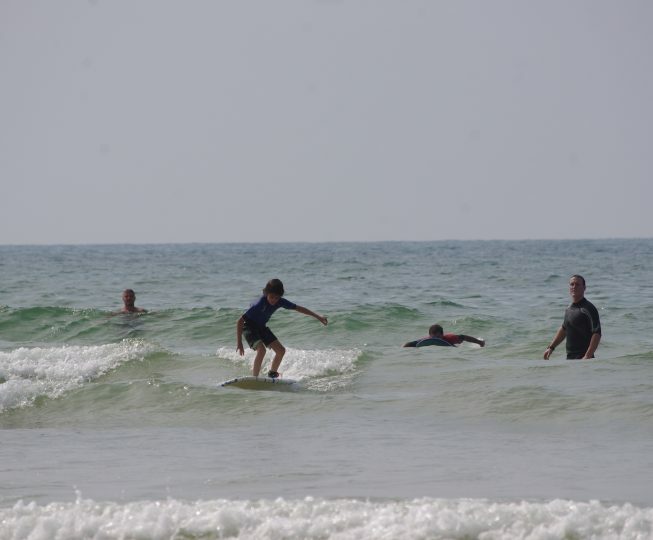 The kids surf lesson allows the young novice surfer (from 8yrs, even less if accompanied) to get their first taste of what it’s like to surf in a safe environment and with the best suited material. Themes : Discovery through game form. Adaptation to a new environment. Responsibility and gain in confidence. Choice of equipment: wetsuit with a surf board or body board. The teenager surf lesson encourages the adolescent to become aware of the sheer force inherent in nature, they will appreciate the size and pure power of the ocean first hand. They will learn how to appropriate these forces whilst at the same time discovering their own limitations. But most importantly, they will have an amazing time and really enjoy themselves in the process. 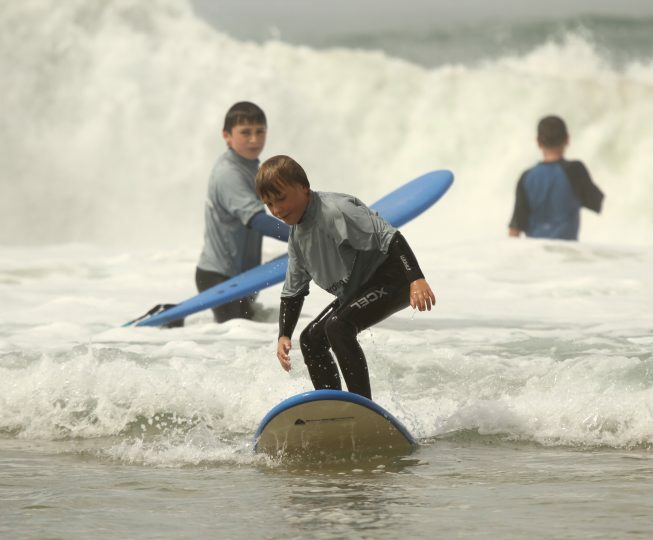 Various other aspects of learning to surf that the young surfer will learn to deal with are : self control, respect, how to confront, accept and deal appropriately with challenges, but also, how to deal with frustration. Once you put all of these aspects together and add a certain level of apprehension, the younger surfer usually surpasses themselves. 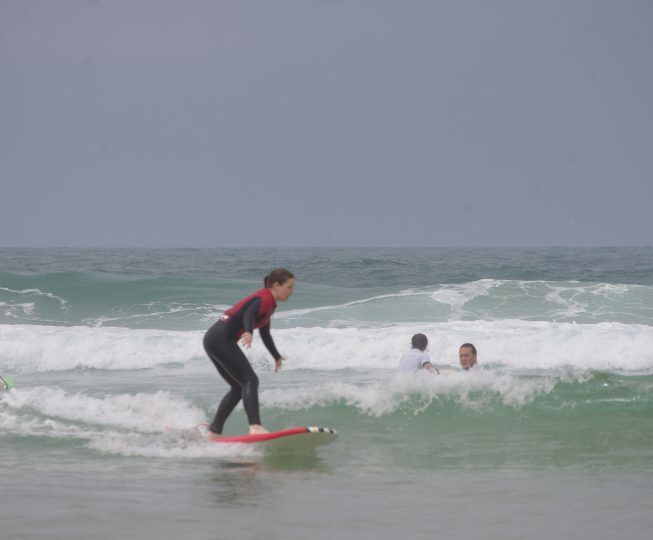 The fact that during a surf lesson they can break through their self imposed boundaries really helps adolescents gain self esteem and increase their self confidence, specifically confidence in the own capacities. Themes : Discovering ones own limits. Self confidence. Learning to listen to ones instincts and gain a certain level of skill in reading and understanding an important element in nature which in this case, is the ocean. 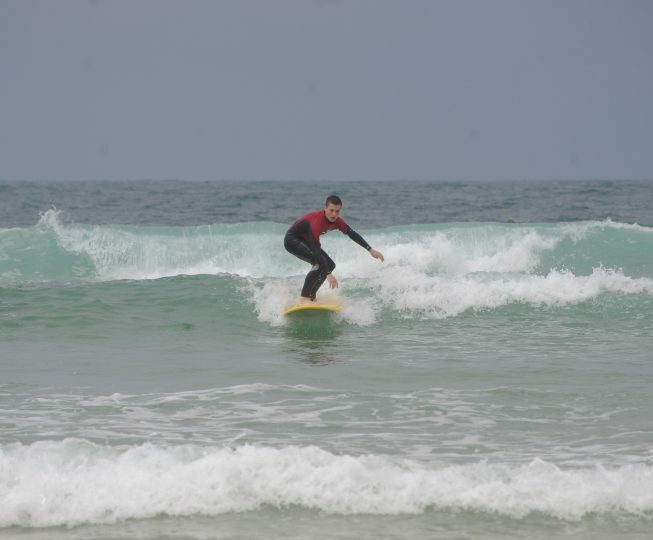 An example of a standard teenager surf lesson. Introduction to the elements: the waves, the currents, the sand banks and deep water troughs. And most importantly the rules of safety. (This is an interesting introduction particularily for mums and dads present). Warm up in the water: explanation, demonstration and practice in the art of bodysurfing (allows both the coach and the young surfers to get a feel for the power of the waves and the currents. Finding your balance on the surfboard in a lying position: on the beach then in the water. The aim is to catch a white water wave or broken wave whilst lying on the surf board. This allows one to become accustomed to the handling of the equipment in the ocean, the positioning in the ocean and the process of catching a wave. But also the importance of weight distribution on the board and it’s effects. Having the right equipment is a big part of success. The surf board must be suited to your height and weight and to your ability. The wetsuits specifically for Men Women and children that are adapted to the season. Spring suits (3/2), summer suits (2/2) and winter suits (4/3). Access to the changing booths (heated in the winter) and a place to store your personal belongings in safety.